Q) Why should flip-up extensions be installed? A) Every house or building that has gutter extensions that reach into the lawn should have a flip-up installed. This makes it easier to keep the extensions out of the way while mowing, landscaping, or working around the building, which protects the extensions from being damaged. Q) Are Tiploks easy to install? A) Yes, installing Tiplok gutter clips is as simple as snapping them into place on the downspout, then sliding them up or down the downspout to adjust it to the height of the extension. 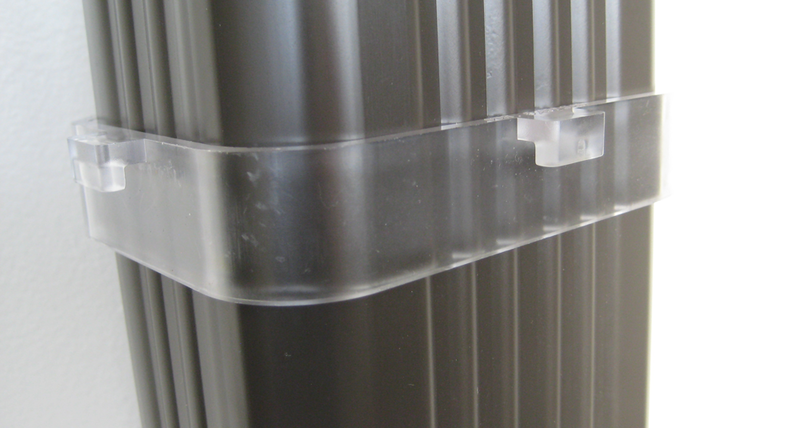 Tiploks easily snap into place on the gutter downspout and are clear to blend in with the downspout color. Q) Will Tiploks clips match my gutters? A) Yes. Tiplok gutter clips are made of clear acrylic, so they blend in and match with any color gutter.